Reigning UFC light heavyweight king Jon Jones certainly has more important matters to tend to at the moment, but he will likely be keeping close tabs on what goes down down Saturday in Sweden. Jones’ next opponent will emerge at UFC on FOX 14, and it could be a familiar foe, when top contender Alexander Gustafsson (pictured) faces Anthony Johnson for a crack at Jones’ crown. Gustafsson has been here before. He initially proved he was deserving of a title tilt against the most decorated 205-pound champion in UFC history by beating former champ Mauricio “Shogun” Rua in December 2012. When the moment finally came to meet arguably MMA’s most unbeatable man, Gustafsson became the only fighter to make Jones look human. He took Jones to deep waters, but ultimately lost a unanimous decision. The verdict was so controversial that UFC president Dana White was initially open to arranging an immediate rematch. White decided to go in a different direction after watching the thrilling 25-minute affair again. White wanted to give Jones fresh meat in Glover Teixeira and assigned Gustafsson to then-undefeated Jimi Manuwa to once again prove his mettle. Gustafsson easily disposed of Manuwa and was granted the sequel he desperately protested for after Jones defeated Teixeira. 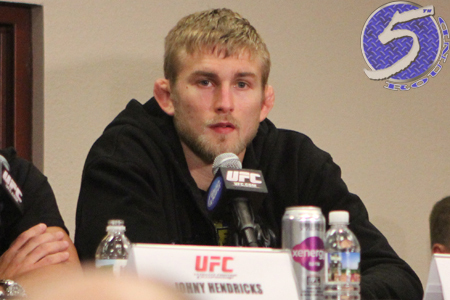 Unfortunately for Gustafsson, he injured his knee and was forced to go under the knife. Daniel Cormier gladly stepped in to fight his longtime rival at UFC 178. Jones then suffered an injury and his bout with Cormier was postponed. The timing was right for Gustafsson to return from knee surgery to reclaim his top contender moniker, but Jones and Cormier got into their epic brawl inside the MGM Grand lobby and there was no way the UFC wasn’t going to ride that pay-per-view money train straight to the bank. Gustafsson threatened to sit the sidelines and await the winner, but White forced him to take another fight to cement his next dibs status. He was issued Rashad Evans, a former champion coming off a knee surgery that’s kept him out of action for 14 months and counting. Evans decided his knee still wasn’t right and Blackzilian teammate Anthony Johnson replaced him. Unfortunately for Gustafsson, Evans was a much more winnable fight. Johnson has completely reinvented himself into a lethal light heavyweight tank since finally accepting that he’s not a welterweight (or middleweight). If you’ve ever seen “Rumble” in person, that’s one intimidating and beastly linebacker. And that’s how we arrived here. Gustafsson had to jump through several additional hoops, but he’s once again on the doorstep. A loss would likely cost him at least another 18 months before he’s even mentioned in the same sentence as Jones.